What are the partners from the Group on Earth Observations Biodiversity Observation Network (GEO BON) doing regarding the development of a Global Observing System for Biodiversity? 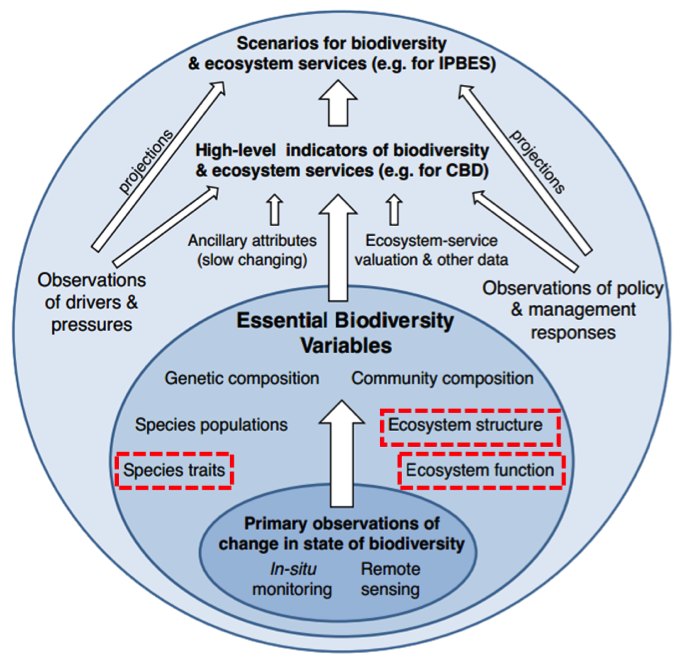 Among their big challenges, the definition of Essential Biodiversity Variables (EBVs, Figure 1) is one of the key concepts being addressed by this circle of experts. This post briefly describes EBVs and provides examples of related studies, including collaborative initiatives within King’s geography hubs, that contribute to developing or assessing new candidate variables particularly those based on Earth Observation Systems (EOS). Figure 1. 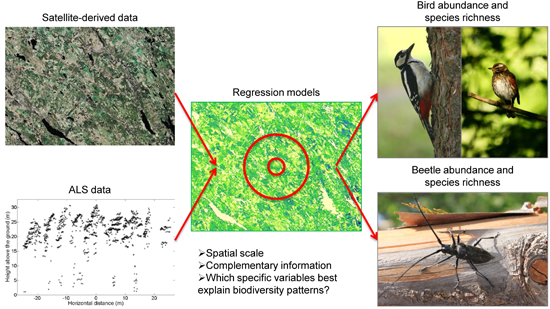 There are many questions regarding the understanding of the dynamics of global biodiversity and EBVs aim to find a minimum set of essential measurements to capture major dimensions of biodiversity change. Image source: Lindberg et al. (2015). What are Essential Biodiversity Variables (EBVs)? An EBV can be interpreted as a measurement required for the study, reporting, and management of biodiversity change . Although hundreds of variables potentially fit this definition, a group of experts has been developing and testing a process, still ongoing, to identify the most essential . This group of experts claims EBVs facilitate data integration by linking primary observations and indicators. EBVs are currently grouped into six categories, of which only three (species traits, ecosystem structure and ecosystem function) can be supported by EOS as highlighted in Figure 2. Nathalie Pettorelli, who led the talk introducing the concept of EBVs at the ZSL symposium , stressed the fundamental role and challenges that EOS has in the development of a global biodiversity monitoring strategy. Under the deﬁnition of satellite remote sensing (SRS) EBVs, Nathalie and her collaborators1 argue the development of this term will require a clear understanding of what makes a biodiversity variable essential, as well as agreement on who the users of the SRS-EBVs are. Figure 2. Proof-of-concept Biodiversity Global Observing System framework developed by GEOBON members. EBVs that can be supported by EOS are highlighted by the red-dashed boxes. Image adapted from: Pereira et al. (2012). Nathalie Pettorelli concluded her talk  stating “there are many opportunities to develop new things under the forming global biodiversity monitoring framework”. Within these opportunities, new developments need to address the pitfalls  (scale, time, metrics, uncertainty) that currently exist. Duccio Rocchini, the proceeding speaker , acknowledged these pitfalls whilst enthusiastically highlighting to the attendees the concept and application of a candidate SRS-EBV called Rao’s quadratic entropy (Q). In comparison with the classic heterogeneity indices commonly used in ecology (I.e., Shannon H’), which usually consist of a single informative layer and do not necessarily consider the distance between the measured units, Rao’s Q integrates both the relative abundance of the measured units and the pair wise distance between them, thus allowing for the integration of a potentially infinite number of information layers . The implications of using the Rao’s Q applied to remotely sensed images were illustrated by Duccio’s latest slides, particularly in a large area as Europe (Figure 3). Duccio and his team stress that “the routine application of Rao’s Q to remote sensing data would expand the information usually retrieved by other heterogeneity indices” . Figure 3. Comparison between the Shannon H’ and Rao’s Q indexes applied in MODIS NDVI data across Europe (NUTS 3 countries). Rao’s Q discriminates complex patterns of heterogeneity when others indices saturate. Image source: courtesy of Rocchini et al. (2016) . …and the role of King’s EOES group? The EOES research hub is participating in a set of collaborative initiatives, mainly with King’s Water and Geocomputation research hubs, focused on urban ecology, inland water and low-cost Arduino sensor networks. These initiatives are an opportunity to assess or propose candidate SRS-EBVs at multiple scales in support of biodiversity monitoring. Moreover, as a recent member of King’s EOES, I found invaluable the attendance for this symposium to my PhD research which seeks to better understand Land-Use and Land Cover (LULC) trajectories in post-deforested areas in tropics. Considering LULC data are one of the most used SRS-EBVs for assessing ecosystem structure, I am keen to contribute my findings to the development of new LULC SRS-EBVs that support global biodiversity research, in particular strategies for conservation and land-use planning in pristine tropical ecosystems such as humid and dry forests. The author is grateful to the Earth Observation and Environmental Sensing hub for providing funding for the symposium registration fee. Additionally, the author acknowledges the revision made by his King’s EOES colleagues (in alphabetical order – Claudia, Emma, Kelly and Kris). Pettorelli, N. et al (2016) Framing the concept of Satellite Remote Sensing Essential Biodiversity variables: challenges and future directions. Remote Sensing in Ecology and Conservation 2056-3485. Pereira, H. M. et al. (2013) Essential biodiversity variables. Science 339, 277–278. Pettorelli, N. (2016) ‘Introducing the concept of Satellite Remote Sensing Essential Biodiversity variables’ Unpublished presentation at: Space – the final frontier for biodiversity monitoring? Symposium, 29 April 2016, ZSL Meeting Rooms, London. Rocchini, D. et al (2016) Satellite remote sensing to monitor species diversity: potential and pitfalls. Remote Sensing in Ecology and Conservation 2(1), 25-36. Rocchini, D. (2016) ‘Biodiversity from space: pitfalls in measuring community diversity from outside the Earth’ Unpublished presentation at: Space – the final frontier for biodiversity monitoring? Symposium, 29 April 2016, ZSL Meeting Rooms, London. Rocchini, D., Marcantonio, M. & Ricotta, C. (2016) Measuring Rao’s quadratic entropy from remote sensing, an open source solution. In preparation. This entry was posted in Conference reports, Earth Observation and tagged Biodiversity, Conservation, Remote sensing by Clemence De Butler. Bookmark the permalink.